The Outlaw Josey Wales (Gone to Texas) (1973)/The Vengeance Trail of Josey Wales (1980) – Forrest Carter – I reviewed these two stories after I read them back in May 2013. I’m a big fan of westerns; movies and books. I’ve been getting back into reading pulpy western books in the last year or so. I loved the Clint Eastwood Josey Wales movie so I decided that I needed to read the original novel it was based on. And the sequel to that novel. They are both great and it makes me sad that Eastwood never made the second Wales story into a movie. It would have been awesome. These are two good, classic Old West action novels. The Last Mountain Man (1984)/Return of the Mountain Man (1986) – William Johnstone – After reading the Josey Wales books I was hungry for more gunfighter action. I discovered Johnstone’s Last Mountain Man series through an Internet search. This author is PROLIFIC. We think Stephen King writes a lot of books, check out the number of books this guy has written. BANANAS. This particular book I read is an omnibus which collects the first two books in Johnstone’s seminal series about gunfighter Smoke Jensen. Written very much in the style of the Josey Wales books which isn’t surprising as the second Josey Wales book was published a mere four years before these books. Great western action contained within. Heroes of Olympus series – Rick Riordan – This is the newest incarnation of the Percy Jackson series. It’s currently on Book 5, which you see above, but I read both book 4 and book 5 this year. They are EXCELLENT reading. I love everything about this series that adds layers and layers to the story with every book that is released. This series really reminds me of Harry Potter. Fun, magical and it gets dark in spots. Lots to love, especially the way Riordan deftly merges in Greek/Roman mythology into the story line. Those are my favorite books this year. Here are the comics and graphic novels I liked the best. Batman: Hush (2002) – Jeph Loeb (writer), Jim Lee (artist) – As you’ve no doubt heard on my Nerd to Dos this past year, I’ve been on a real Batman comic reading kick lately. Mostly thanks to Kevin Smith’s Fatman on Batman podcast. This has been my favorite Batman story I’ve read so far. Great art, great story. Lots of awesome DC hero cameos. This is hands down one of my favorite Batman stories of all time. Flashpoint (2011) – Geoff Johns (writer), Andy Kubert (artist) – I’m a big fan of Flash and I love Andy Kubert’s art. So this was a no-brainer. Plus, this is what led into the big DC New 52 “reboot” so I had to see what was up with that. Now, I’m only talking about the actual 5 issue mini-series, not any of the numerous “tie-in” or “spinoff” books (which there were many). But this 5 issue run is AWESOME. The world it creates is fascinating. I’m actually going to go back and read some of those Flashpoint spinoff books because this is so good. I also want to check out that animated Flashpoint Paradox movie to see how well they adapted the story. I liked this even better than the great Blackest Night 8 issue series. The Sixth Gun (2010) – Cullen Bunn (writer), Brian Hurtt (artist) – This is a currently ongoing title that started back in 2010. I’ve read the first 32 issues and I’m in love. This is a supernatural western, or “weird western”. Based in the Old West it has many elements of the supernatural, magic, voodoo, dark gods, undead souls and monsters. The story revolves around six guns that are each cursed with terrible powers and the battle between the good guys and the bad guys to possess the weapons. This book is so good and I can’t recommend it enough. It makes me so happy that such a good western as this currently exists. The Walking Dead (2003) – Robert Kirkman (writer), Terry Moore (artist), Charlie Adlard (artist) – I read and reviewed the first 30 issues or so of this title for AWESOME-tober-fest this year. The comic is excellent and Kirkman is one of my favorite comic writers. My only caveat is that this story is TOO dark. It’s just so damn bleak that it becomes a chore to read after a while. Consequently, I haven’t read anymore issues since I finished issue 30 back in May 2013. I can’t guarantee that I’ll ever pick this series back up. But it’s not because it’s bad, it’s because it’s so well written that it becomes tough to read. Seriously, read this title if you haven’t already. Batman & Robin v1 (2009) – Grant Morrison (writer), Cameron Stewart (artist), Frank Quitely (artist), Phillip Tan (artist) – I sort of fell in love with this Batman & Robin title. I picked it up because Morrison wrote it, it was mentioned on the Fatman on Batman podcast and I was very curious to read more about the adventures of Damian Wayne as Robin since he had just recently died. This is a great series. I read the first 10 issues of the full 26 issue run. Excellent work. As a matter of fact, the followup new 52 title, Batman & Robin v2 by Peter Tomasi and Patrick Gleason is also pretty awesome. Those are my favorite books and comics I read in 2012. It was a good year. Hopefully, this year will be even better. Speaking of this year, there are several books I’m looking forward to, but one of them stands out above all else. 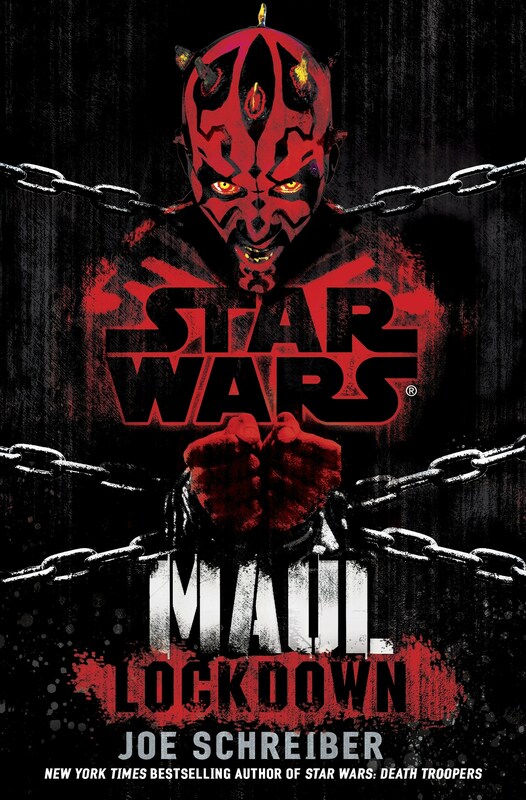 Joe Schreiber, the author of Star Wars: Death Troopers is releasing his latest book, Darth Maul: Lockdown . I am so excited by this book I can barely even stand it. It looks all kinds of amazing. And luckily, I don’t have to wait long because it is being released in about two weeks on Jan 28, 2014. I fully expect this book to be on my favorites list in 2014. This entry was posted on January 10, 2014 at 7:00 am and is filed under Batman, books, comic books, movies, pop culture with tags Book Report, books, gunfighters, reviews, Star Wars, westerns, Year End Books. You can follow any responses to this entry through the RSS 2.0 feed. You can skip to the end and leave a response. Pinging is currently not allowed. Kudos! I don’t know how you get to all this. I didn’t read much this year. I did get through a few random comics and read a lot of “American Gods” by Gaiman. I did watch the animated Flashpoint Paradox movie. Pretty cool. Oh yeah, I did read a little book called “Make Love The Bruce Campbell Way”!!! You may have heard of it. Hmmm, I have not heard of this “Make Love…” book. Tell me more. I think I want to start hitting up more novelizations too. I think we’ve mentioned this before, but why was there never a novelization of Young Guns?!? I don’t know, Shawn. For years I thought a Young Guns novelization existed but I was never able to find it. Then came the Internet and I discovered it never existed and that my dream would never be realized. Thanks, Internet, for crushing my dreams. I listened to the first Percy Jackson books and should really get to the next couple of them. Sometimes the banter felt too young (probably moreso on audio than print) but they were a lot of fun. 50+ books is still fantastic. Just ask any of your coworkers…I’m guessing some didn’t read a single book last year. Enjoy your 2014 reading!! Great post Pax. Can I ask a serious question about when you find the time to read so much? You’ve got two small kids (our second is a month away) and you also run, blog, podcast etc. Do you read in the evenings or in bed each night? Are you just a fast reader? I’m always trying to increase my reading but just find it hard to fit in, particularly with children. Using the Kindle app has helped but I still prefer physical books. Valid question. I actually get that a lot. My biggest reading time is my 1 hour lunch at work. I force myself to leave my desk and take my lunch so I can get some “away” time from work. I HATE working lunch. I will sometimes get to read at night before bed, but not a lot. Weekends are usually no-read as well unless BOTH kids get to take a nap at the same time…which is rare. I don’t honestly think of myself as a fast reader, but my wife says I am. And maybe I am. But I just try to fit in reading whenever I can. It’s amazing the things you do to fit stuff in your schedule when you have kids. I swear, what did I do with all my goddam time before I had kids?! Since the little ones I’ve had to shift my running from evenings to getting up at 4:30-5am and doing it before work. There’s no way I’m going to run after work and miss prime play time with the kids before they go to bed. I podcast after 8pm when the kids are asleep. And you may have noticed, but this blog has been sort of neglected for a while simply because I am doing all this other stuff. And my kids and wife come first. But, it’s all in the planning. I’m trying to do as much as I can and I’m not getting to do it all, but I’m trying. Thanks for reading, man. Congrats on the upcoming arrival. Get ready for it to rock your world (but in a GREAT way). Thanks for taking the time to answer that Pax. Yeh I don’t think I’ve ever been so organised in my life as I have been since we had our first child. I’ll probably get even more time efficient once our second arrives. Hopefully I can work more reading into those time windows when I get the chance though. Those two Star Wars ones look great. Cheers.